Margaret Blank: Thoughts from a Textile Artist: Where did August Go? "I've been busy" is such a trite phrase, but it's been true in this neck of the woods! Following my son's wedding, and finishing my 15 x 15 Group piece for July 31, as well as that one that came 'out of the blue', I've been focused on Handwork and Home Maintenance! On the Home front, I finally swept last winter's detritus out of the garage, cleaned my eaves troughs (gutters), painted the railings of my back stoop and with the help of my neighbour, repaired the bottom step. I still have to strip the last of the wall-paper off one wall in my bedroom, paint said wall, and while the furniture is out of place, clean the carpet! Then...clean the carpet in the hallway and living room. Oh...and freeze or bake up the last of the rhubarb. A good year or so ago, my friend B gave me an old Pfaff mechanical machine. She'd been given it and her DH had cleaned it and installed a bolt (!) to replace its missing presser foot lever. That said, she didn't want it and passed it on to me to use as a spare. I played with it briefly...it worked like a charm till said bolt snapped off! Well...it sat around till I could get my act together, and I took it into the 'spa' along with the Lily a couple of weeks ago. The good news? No repairs needed other than the new presser foot lever -- which was in stock. Ta-da! I end up with a decent machine for about $100 CAD all in, and Ms. Pfaff is now ready to pick up any unfinished work that Lily leaves behind! I've so much to do this fall that I'm seriously considering setting Ms. Pfaff up on my kitchen table, with Lily in the sewdio. That way I can have two projects going at the same time and not have to worry about changing thread colours etc. 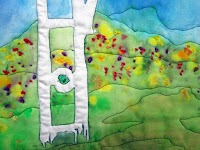 Work extra days for The Shop, at two out-of-town Creative Stitches and Crafting Alive! shows -- one in Edmonton and one in Calgary. So if I seem a bit quiet in blog-land, do please forgive me. There will be MOB progress reports over on that blog around the end of each month (29th - 31st) at least until the Opening (October 20). Right now, I've got to get going to Red Deer to pick up those machines! Meanwhile, I'm linking up to Nina Marie's Off the Wall Friday...and hoping you all stay in touch. Have a great weekend! Yes where did August go? You sure have a lot on your plate. Some of it sounds very exciting. Great to read all that has been keeping you busy. So excited for your upcoming show. Wish there was a way to get up there! It's good to know that quiet in blog-land means busy in the sewdio. You have a lot on your plate.....the perfect time to set up a second sewing machine. A busy couple of months but filled with good things! I wish you well in your journey!